Nine people have been charged with breach of the peace following an incident at a meeting about ID cards in Edinburgh. There were protests as a Home Office minister was meeting business leaders and local government officials to outline the proposals. Activists were removed by police and nine have been charged. The event was part of a UK-wide consultation which allows organisations to give feedback on the plans. A number of protestors had gathered outside a hotel where the meeting was taking place. Activists said that one protester had entered the meeting room, while others were not allowed access. When they refused to leave they were removed by police and arrested. The Anti-ID card campaign group NO2ID said repeated requests for them to attend the consultation had been refused and they branded the process a "sham". Geraint Bevan, the group's co-ordinator in Scotland, accused the Home Office of refusing to listen to the public on the issue. He said: "The ID database will result in a massive erosion of privacy for individuals. "Ministers have declined our invitations to attend genuine public meetings. "They are clearly scared of hearing what the public might say." The Home Office minister for identity, Meg Hillier, said: "We are committed to providing people with the option of having an identity card which will make day-to-day life much easier. "I am convinced, like people everywhere, the people of Scotland are keen to protect themselves and their families against identity fraud, as well as protecting their communities against crime, illegal immigration and terrorism." Green MSP Patrick Harvie said: "When government ministers refuse to attend public meetings but instead hide behind secretly organised 'consultation' meetings, we know New Labour is losing the plot. "But when peaceful protesters are arrested for simply standing up against a government's abuse of power, then anyone who cares about liberty should be outraged." 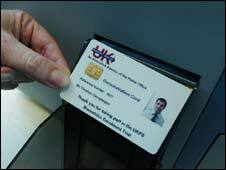 Plans to introduce ID cards were laid out by the home secretary in March. The cards will be mandatory for some foreign nationals from November and for airport workers from next year. From 2010, students will be able to apply for a card on a voluntary basis and the following year it will be available to anyone who wants one. Under the plans, the full roll-out would be in 2017. The public consultation on ID cards ends on Monday - comments can be e-mailed to Consultation Response at identitycards@ips.gsi.gov.uk.